Well, we sure missed everybody for Christmas, but it was so fun to be in warm weather, warm weather, ummm did I mention the warm weather? (Just had to tease Clint) Here are just some of the fun things we did. We have so many pictures that we will have to same some for when we all see each other We thought this was the strangest thing ever!!! 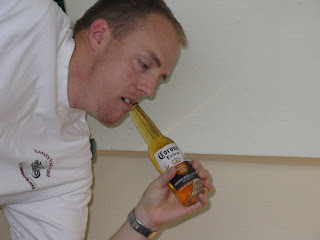 Creme de cachawhate? 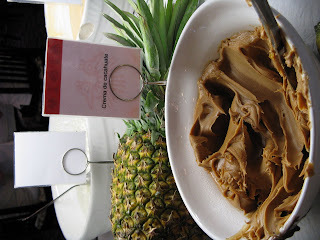 hehe... it was peanut butter, doesn't that just make you want to eat a bunch!! 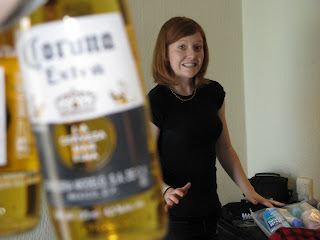 AT the hotel we could get any kind of drink we wanted and it was all included. Our room was filled with all kinds of spirits... Jordan thought we should try some so he took a drink,,,, but me being the good angel I am got scared and tried to run when he tried to force it upon me! 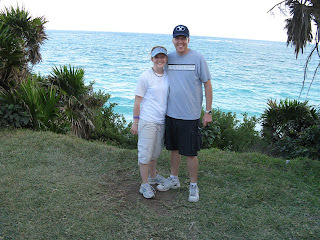 THis is a picture at some of the ruins we went to. 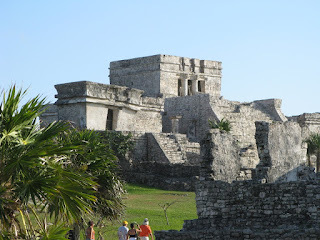 (Tulum) At these ruins one side of them was on the beach and the other was surrounded by big walls. The way they think this was protected by being at sea was that there was a place that didn't have any reef that was just big enough for one ship to come in. 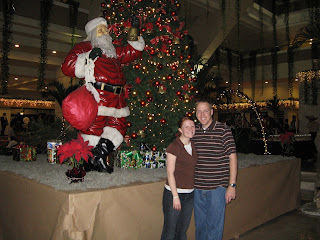 On the building (the Temple) that is in front of us in the picture had two windows for lights. They line up perfectly witht the reef. If the sailors could see both lights, they knew they were coming in straight and wouldn't sink the ship. If they could only seen one, they knew they needed to straighten out. It's neat to think of the Temple as the lighthouse! I don't know if you all can see what is happening here, but while we were visiting the ruins, all of a sudden we see this dad take his little girl--- right out in the open--- and held her up to go to the potty. We couldn't resist, we had to take a picture. This was at another set of ruins we visited. 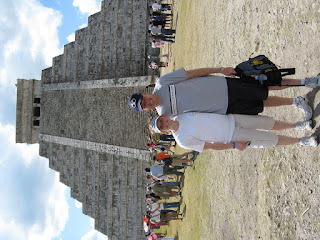 This is another temple that was huge! It was cool because it has 91 steps on each side of the pyramid, which equals 364 and then it has one more step that goes into the Holy of Holies at the top which makes 365--- can anyone guess what that number is--- thats right the number of days in a year! 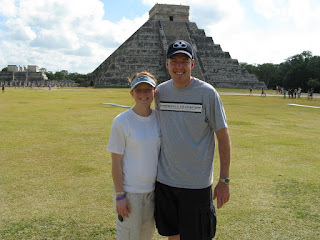 Don't we look cute--- hehe We are probably the whitest people that the ruins had ever seen! 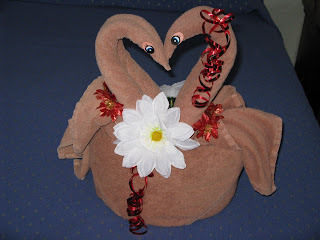 Our maids at the hotel left us 2 pretty swans for Christmas. We thought they were so fun! 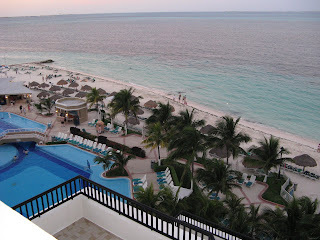 This is looking out of our balcony at the ocean and beach that we played at. The water is so clear! 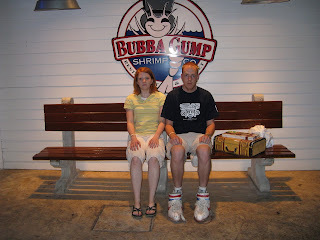 Can anyone guess what movie Bubba Gump's Shrimp house is from? If you guessed Forrest Gump you are right. They had this sitting right outside the door, and we couldn't resist. Doesn't Jordan make a good Forrest with cool shoes and everything? This was on Christmas. They had a nice big Santi Clause there to keep us company. Who would have thought? Those are awesome pictures! I would really like to see them all. I'm happy for you.